These Crisps appeared to be a little more crispy and crunchy than many of Asda's ordinary range of Crisps. The first two or three bites were crispy, snappy, and the crack continued until halfway through the eating process when mush took over. A classic looking Crisp all round. Well, certainly a classic own brand style of Crisp at the very least. There were oil boils, but not many. The Crisps were somewhat bendy and curly. The edges were ragged as seasoning crumbled off each Crisp. The colour was a mid-range yellow with a smattering of orangish powdery seasoning. A Nose Plunge Test revealed a certain Roast Chicken smell, even if it was rather mild. We always find it difficult to review Chicken flavour at Chips & Crisps, simply because none taste of Chicken. 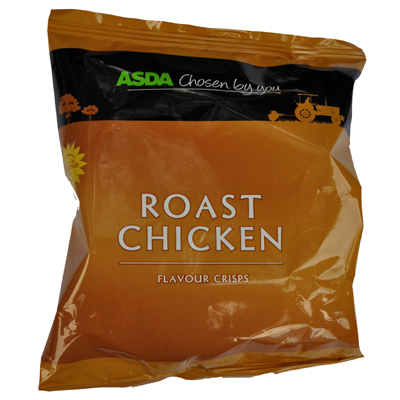 The flavour is more akin to Chicken stock than Chicken itself, which roasted without seasoning has little taste. So, to compare these Crisps to peers, it would probably be fair to say that while they were only mildly potatoey Chicken stock flavoured, the flavour was undeniable.